We spent 45 hours researching and testing more than 15 different types and styles of dog brushes and found that performance, durability, and cost were the most important factors with consumers shopping for dog brushes. FURminator deShedding Tool for Dogs scored high marks in all categories and is our overall top pick. This stainless steel deshedding tool gets below the topcoat of your dog to easily and safely get rid of the loose hair your dog’s coat has. The FURejector cleans easily with the push of a button and the ergonomic handle makes it comfortable to hold while grooming your dog. Proper dog grooming not only keeps your dog’s coat in great health it also provides you with an opportunity to bond with your dog as well. Regular brushing will reduce the amount of hair that is left all over your furniture and carpet and makes your dog feel better as well. To get the best results from your grooming routine you should choose a dog brush that is designed for dog’s hair and not a regular hair brush. There are many different types of dog brushes on the market to choose from. Different dog breeds require different kinds of brushes so the breed of dog you own is an important piece of information that will lead you to the right brush. With all of these choices available, choosing the right brush for your dog can be really overwhelming. We have provided reviews of the three top-rated dog brushes on the market for you to take a look at. These three brushes are high quality products that do a great job of getting rid of loose hair and keeping your dog’s coat in great shape. In addition to these reviews we have provided a buying guide that will educate you on the different types of dog brushes there are as well as what to look for when you are shopping for a dog brush for your fur baby. 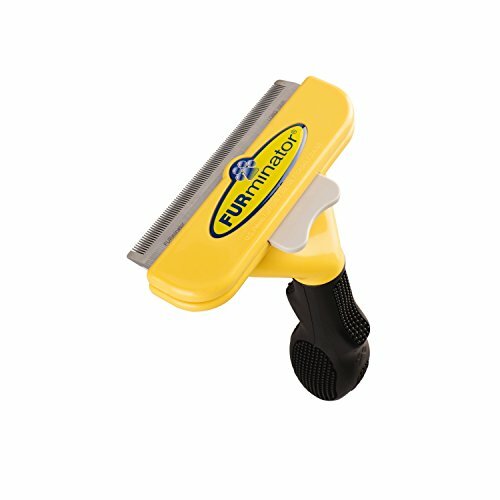 The FURminator deshedding dog brush is the perfect brush for getting rid of loose hair on your dog. 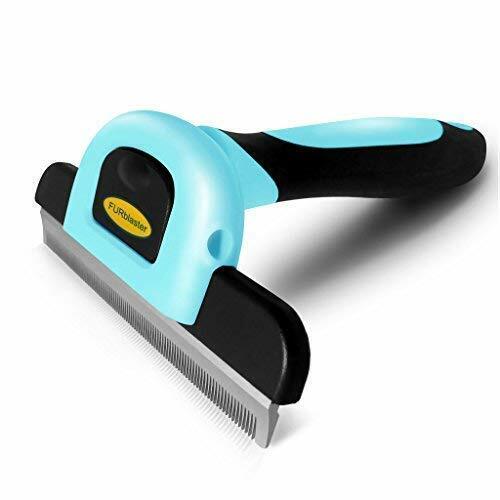 It is made from durable and long lasting stainless steel that reaches through the top layer of your dog’s coat to reach the undercoat without damaging the coat or scratching or cutting the skin the way some lesser quality brushes can. This deshedding dog brush is perfect for long haired dogs that weight between 50-90 pounds. The ergonomic handle is comfortable to hold while you brush. Cleaning the FURminator after using it is very easy; just press the button and the loose hair releases easily so you can throw it away. Using the FURminator deshedding brush will reduce shedding around your home and give you the opportunity to bond with your dog while you keep their coats in excellent condition. There are other sizes of the FURminator available for those with smaller dogs. Another great product on the market for getting rid of loose hair and improving your dog’s coat is the deshedding brush from Dakpets. This deshedder is designed by grooming specialists that understand what a dog’s coat needs to look and feel its best. This special dog brush reduces shedding by up to 95% which means less hair all over your clothing, furniture, and carpets. The DakPet deshedding brush is made from non-irritation stainless steel that is long lasting and replaceable if needed. The rubber handle is durable and provides a non-slip grip so brushing your dog is much easier. This brush is so good it is all you need to keep your pet’s coat in top shape. This deshedding brush is recommended by professional groomers and veterinarians as well. There are replacement combs in yellow, blue, and pink if you choose and are good for pets of all shapes and sizes. Using this deshedding tool can reduce mites, ticks, and fleas as well. The company offers a money back guarantee for the lifetime of the brush so if you are unhappy or the brush breaks they will replace it for free. Use the DakPet deshedding brush to provide your pet with the healthiest coat possible. If you are looking for an easy to use pet grooming tool, you will love the pet grooming glove that can be used on cats, dogs, and horses too. This five finger design allows easy grooming of even the harder to reach spots like the face or tail without causing upset to your pet. The rubber tips of the gloves provide a relaxing massage-like grooming session for your pet that they will look forward to and sit quietly for. These gloves are perfect for long, medium, and short coats and will reduce the amount of shedding your pet does which will improve your home’s cleanliness. The glove easily removes tangles and loose hair so it sticks to the glove rather than flying around getting on your clothing and home. 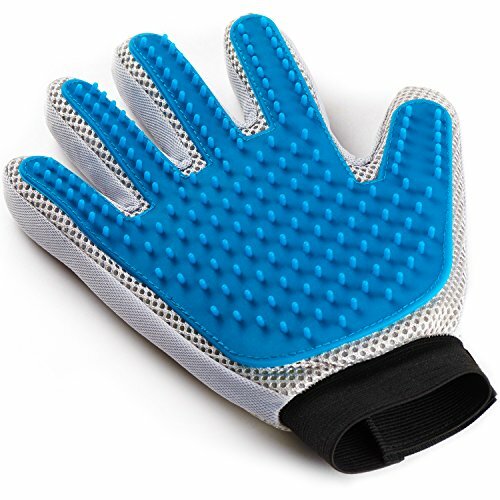 You can use this glove when your pet is dry or wet and works great with detanglers. The adjustable wrist strap secures the glove on your hand for a secure grooming session your pet will look forward to. This pet grooming glove is easy to clean; just peel the excess hair off the glove when you’re done brushing them and you’re all finished. These three top-rated dog brushes are all high quality products that provide exactly what you need to keep your dog’s coat in perfect health easily and without stress to you or your pet. All three of these dog brushes are made from quality materials that are designed to be long lasting and durable. Taking the time to find the best quality dog brushes you can find for your pet will ensure a healthy coat and an enjoyable experience for you and your pet. Shedding is a common problem, especially with long-haired dogs and can result in bothersome loose hair all over your good clothing, furniture, and carpets. This loose hair can cause your vacuum to get stopped up as well. Brushing your dog regularly will reduce this shedding problem while improving the condition of your dog’s coat. Once you are ready to purchase a dog brush, considering one of the three top-rated products we have reviewed is a great place to start. If you do not find what you are looking for in these three products, we have added 7 more selections for you to consider as well. There are many benefits to brushing your dog on a regular basis. We have listed these benefits below. Distributes natural oils – Regularly brushing your dog’s coat will tone their muscles and improve the blood circulation as well. The natural oils in your dog’s skin will be spread around their entire body so their coat looks shiny and healthy. Healthy skin – Using a pet grooming glove or massaging brush helps to remove dead skin cells that can cause skin infections and parasites. It also gets rid of pollen, grass and other problematic substances from their fur. Another benefit is a healthier and stronger coat. Reduced shedding – No one likes dealing with a pet’s loose fur all over their clothing, couches, chairs, and floor. Long haired dogs shed a lot more and the problem can become so great you may feel like you sweep or vacuum up enough hair to create another dog. Regularly brushing your dog with the proper dog brush will reduce the amount of loose hair that you find all over the place. Most brushes keep the hair attached to the brush so throwing it away becomes very easy. Prevents matted fur – Dogs that don’t get brushed regularly can develop mats which can cause skin problems as well as cause painful pulling on your pets skin. Regularly brushing your dog will prevent these mats and keep your dog’s fur in great shape. Increases bonding – Another great benefit to regular brushing is the bond that it can build between you and your dog. It is a great way to reduce your own stress as there have been many studies that have shown how brushing or petting your pet can reduce your blood pressure and stress. If you choose a quality brush that is made well and comfortable for your dog, they will look forward to these brushing sessions as much as you do and they will look great too. Selecting the right type of dog brush for your dog is very important to their well-being and the health of their coats. With all of the different types on the market you may be confused about the right brush for your dog’s needs. Choosing the wrong brush can result in damaging your dog’s skin or coat and can cause a negative experience for your dog that will result in them disliking grooming. Below we have listed the most common types of dog brushes that are on the market along with information about each so you can tell the difference between them. Slicker Brush – A slicker brush is a common type of dog brush that has been around for a long time. They have short, fine wires that form a flat surface and are very close together. This type of brush is used to remove matted fur on medium to long haired dogs. There are many different types of slicker brushes but you should choose one that is the right size for your dog and that has a flexible handle to make grooming easier. Slicker brushes are commonly used on Golden Retrievers, Cocker Spaniels, St. Bernards, and Yorkies. Be careful when using a slicker brush and do not use too heavy a hand or you could cause your dog discomfort. Do not use this type of brush on the delicate parts of your dog that could become irritated by the metal wires. Rake Brush – These brushes are created to get below a dog’s thick coat and remove dead loose hair and tangles from the undercoat. They are usually shaped like a razor and have a couple of rows of pins that are close together. Rakes are not supposed to be used with any kind of pressure and should be used on dogs with thick coats like German Shepherds and Chows. Look for rakes that have pins the length you need. Short pins will not work on a dog with a long coat and long pins could potentially cut a short-haired dog’s skin. This type of brush is not for general brushing and should be used to remove the dead undercoat and any tangles the dog has and then you should switch to a different kind of brush. Bristle Brush – Bristle dog brushes are perfect for smooth-coat, short-haired dogs that are shedding. They have clusters of natural bristles that are tightly packed together and will stimulate the skin and remove loose hair. Bristle brushes can also remove debris and dirt from your dog’s hair and leave it shiny and healthy looking. Bristle brushes are made from natural materials or man-made and have no metal pins. If you have a short-haired dog that sheds a lot, the bristle brush is a great choice. It is a good choice for Boston Terriers, Jack Russells, Pugs and other short-haired breeds. Brushing your dog with a bristle brush on a regular basis will result in improved circulation, shiny fur, and healthier skin. Pin Brushes – Pin dog brushes look a lot like regular hair brushes. They are typically oval in shape and have a set of wires on top with pins on the top that are loosely arranged and flexible. Pin style dog brushes are the most common type of dog brush on the market but are not the most effective. They are good finishing brushes to offer some fluff to your pet but other than that are not very good for brushing. There are two different styles of pin brushes most commonly found on the market. Both are good choices for dogs with wooly hair and also wavy-haired dogs. Many groomers use pin brushes to get rid of tangles on dogs with long hair. Rubber Brush – If your dog has super sensitive skin you may find a lot of benefit to rubber dog brushes. They are the perfect choice for short-haired small dogs or those that don’t need as much help getting rid of loose hair. They are very good at providing a massage like brushing which is really good for your dog’s skin. A benefit to rubber brushes is that they are waterproof and allow you to brush the dog even when they are in the bathtub. They come in a variety of sizes, bristle formations and styles and work very well on the dog’s paws, tail, and ears too. Different dog breeds have different types and lengths of coats. No one dog brush is good for ALL types of dog coats so it is important to know what type of coat your dog has so you can find the right dog brush for them. Below we have listed some of the more common dog coat types. Short coat – Short-coated dogs are found in breeds like Chihuahuas, hounds, and some retrievers. This type of coat works well with a bristle brush that has softer bristles that are close together. Wiry coat – Terriers come to mind for most people when the words “wiry coat” are mentioned. A slicker brush is a good selection for wiry coat dogs and makes brushing very easy. Remember not to use excessive pressure when using any type of wire brush. Super Long Coat – Setters, spaniels, golden retrievers and other long flowing coated dogs should be brushed with a medium bristle brush that has bristles that are wide spaced or at the least medium spaced. This will ensure the bristles are long enough to get through the hair. Wooly Undercoat – Collies, German Shepherds, and sheepdogs have thick outer coats and wooly undercoats so they need brushes that will get through the top coat so it can reach the undercoat and prevent matting and excessive shedding. A pin brush or firm bristle brush that has wide spaced bristles. Thin Coat – Dogs with thin coats including Yorkies and other small dogs the perfect brush to use is a soft slicker style or a wire-pin brush that is perfect for removing tangles and matted fur. Every type of brush on the market is designed to take care of a particular problem or type of coat. Make sure you consider the breed of your dog and the kind of coat is has before you choose a brush. We’ve listed some considerations you should think about when choosing a brush. Purpose of the Brush – There are many different “jobs” a dog brush can have including grooming, removing flea eggs, massaging, detangling, deshedding, and adding shine. It is important to choose a brush for the task at hand so you may end up with several brushes in your grooming kit for different purposes. This is normal and better for the dog than trying to use one brush for many different purposes. Dog Breed – As we have mentioned above, different dog breeds have different coats and require different types of brushes. Know your dog’s breed and choose a brush or brushes that work for their particular coats and the issues you have with them such as shedding, matting, and removing parasites. Along with the breed pay attention to the length of your dog’s coat when choosing the brush. Ergonomic Handle – It takes longer to brush a large dog’s fur than it does a small dog. Choose a brush with a comfortable handle so you do not have to deal with discomfort when brushing, especially if you are brushing a larger dog with long hair. Also look for non-slip handles that enable you to use the brush when the dog or your hands are wet. Pins – Pin brushes are usually designed for dogs that have short to medium length hair. You should consider the shape and density of the pins before purchasing as well. Pins that are widely spaced and have rounded tips are safest for your dogs and will protect the skin as well. Make sure to always use gentle pressure when brushing your dog to ensure the comfort and safety of your pet. Overall performance – How easy the brush is to clean after grooming is also something to think about. You don’t want to leave the brush full of hair and dirt after brushing so pay attention to what needs to be done to clean it after each use. You also want to ensure that the brush is designed properly for easy use so you can brush harder to reach areas like the stomach and base of the dog’s tail. Owning a dog is more than just having something to feed and play with. Grooming your dog is very important to their overall health and is a necessary part of dog ownership. With all of the dog brushes available on the market, there are several things you have to be aware of and think about before you spend your hard earned money. Grooming your dog should be an enjoyable experience for them as well as easy and stress-free for you so having the right tools is paramount to achieving that. The reviews of the top-rated dog brushes on the market are designed to help you learn about three specific types of brush that you can use for grooming your dog. These three excellent brushes are examples of the kind of quality you want to have. The buying guide we have included has shown you what to look for in a good quality dog brush as well as how to determine the kind of brush that will be the best for your dogs. This information will allow you to make a confident decision on the right brush or brushes for your dog that will result in the enjoyable grooming experiences you and your dog want.